Van Gogh sold a total of one painting in his lifetime. In the 17th and 18th centuries, lobster was considered to be peasant food, eaten by poor fishermen, fed to prisoners and even used as fertilizer. Polenta, too, was a peasant food when it was developed during the second half of the 16th century from the maize that was imported from the Americas. However, of all of these things of humble beginnings, only polenta is still affordable, and it's the only one of them that I keep in my apartment as a matter of course. You should, too. If you can find it. Sure, the instant kind seems to be sitting on every grocery shelf, but I'm talking about the real polenta. The kind that stews for 45 minutes or so. The kind that requires love and devotion and a whole lot of stirring. Oh wait, actually, I'm not so big on that last part. On the standing over a hot stove for 45 minutes stirring part. That is just a little too Old World for me. And so, I have two pieces of good news for you. The first, is that you don't have to stir quite that much. And the recipe below, from the Gourmet Cookbook, proves it by asking you to stir only 1 minute out of every 10. You're very welcome. The second piece of good news, is that Bob's Red Mill makes the real kind of polenta. The kind you might otherwise have to track down in a speciality Italian foods store. On the package, it's called both corn grits and polenta, and honestly the distinction is kind of hazy anyway. As Matthew Amster-Burton so well summarizes in his charming memoir Hungry Monkey, "Grits are often made from a different type of field corn (dent corn) than polenta (flint corn), but not always, and I'm not convinced anyone could tell the difference anyway. Grits are usually white and polenta is usually yellow, but you can find exceptions. Grits are often more coarsely ground than polenta. But again, not always." Sounds like just the kind of semantic distinction that makes debate of this kind so, well, semantic. So let's scrap that all together and just agree to accept that Bob's Red Mill is wonderful. And you know what is even more wonderful? Stirring a generous helping of parmesan cheese into that polenta, then topping it with a mixture of quickly prepared sausages sautéed with onions, peppers and fennel. For a true, quick, peasant experience, this beats cutting off your ear any time. You can fine the recipe for the sausages and peppers here on Epicurious. For 4 people, I used a red, orange and yellow bell pepper, one fennel bulb, an entire large red onion and 4 links of sweet Italian sausage as well as the same amount of spicy Italian sausage. The process, however, is the same. Salt the water in a 2-quart heavy saucepan and bring to a boil. Add the polenta in as thin a stream as possible, whisking all the time. Cook over medium heat, still whisking, for 2 minutes. Reduce the heat to low, cover and simmer. Whisk again for 1 minute every 2 minutes until done. For some brands this might take 45 minutes, for Bob's Red Mill it took about 30 minutes. Remove the polenta from the heat and stir in the cheese and butter. Add the salt and pepper to taste. Spoon the polenta onto plates and top with the onions, peppers and sausages. 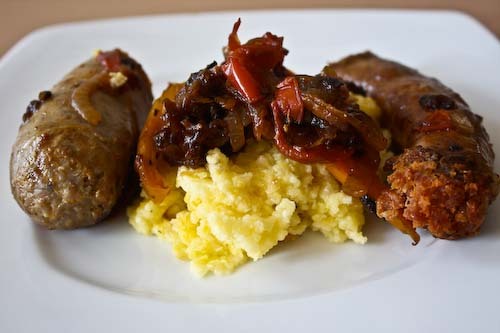 sausages and polenta look very appetizing, creamy and spicy, what a nice combo Andrea! That meal looks really good. Sausages and peppers are a great combo! These sound delicious! I made polenta with goat cheese tonight and there were leftovers - your post is making me want to go back and raid the fridge!